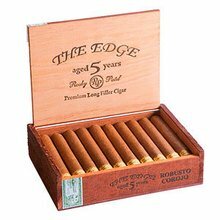 Happy Birthday, The Rocky Patel Edge just turned 10-years-old! To celebrate this momentous occasion, the company has created a new limited edition release .The Rocky Patel Edge A-10 features a barber-pole wrapper with a combination of Corojo and Maduro leaf. Not only is this sought after wrapper extremely difficult to roll, it also adds tons of complexity to the blend. Underneath this work of art reside perfectly aged binder and filler tobaccos from Honduras and Nicaragua. Rocky really out did himself with this 6.00 x 52 gem. You simply must try this celebratory smoke! This stick has such a great flavor that it leaves you wanting to smoke another right after. Fantastic smoke! Great flavor, even burn, solid ash through the 1st and 2nd third. Nice finish at the end. Overall good smoke! Overall, very good cigar. Perfect gift for your cigar enthusiast or average joe. I would definitely purchase again. Pretty good will smoke again. Good draw great flavor. Will recommend to friends that smoke. Very well put together. Great flavor and not a strong smoke. Enjoyed it and I would have it again. Another RP that won't disappoint. Smooth and delicious stick. When it comes to flavor this has everything you found ever desire. Was a very good smoke. Have always love the edge series!. I still like the edge light better, but this was right there with it. Big flavor, not a bad draw. A few of the sticks I've had of these didn't burn consistent, but it happens. Pair this well with a STRONG WHISKEY. Will mellow out the strong tobacco flavor on this one. Had this smoke a while back and really did enjoy it, I do really like Patel’s and this one is one of the mild to medium in their line up. I would definitely recommend smoking this one if you can. Awful cigar. Poor draw. Very tight roll at the tip and loose at the beginning. The flavor is horrendous - chemical taste after letting them rest for 4 weeks. It’s a pretty decent smoke Good flavor nice drags. Would highly recommend to anyone looking for a good stick! Not a bad smoke, Peter piper picks a pickled pepper, how many pickled peppers did peter piper pick? Great stick with a nice nutty flavor. Well constructed and burned to a nice ash. Overall enjoyable smoke, but would not go out of my way to buy again. Sweet spice and leather can be found in the maduro wrapper, a hint of black pepper and earth coming from the Corojo wrapper. I enjoyed this Cigar, it has some nice complex flavors. The burn was even, I didn't have to re-light at all. Nice aroma not to heavy not to light. I would recommend trying this one. I think the dual wrapper gives it a good mix of complex flavors. I will be buying more of these. I always loved Barber Poles and Rocky Patel and this Cigar is no exception! Only wish it came with a 60 ring gauge, but well worth the price. Highly recommend!